I didn’t realise until I photographed the quilts just how much the one on the left reminds me of a tablecloth my mother had on the kitchen table when I was about 4 years, strange what we retain. The quilt on the right fits very comfortably on our king size bed and is just there as an extra protection for when the nights are really cold! I am now down to one bin liner bag full of treasured bits of fabric and feeling quite pious about the whole thing. Not so my fleece stash – so having dusted off my lovely jumbo carder and armed with mini Louet hand combs which I got from Neil for Christmas, I’m beginning to sort through all the portions of dyed fleece ready for spinning. Pics to follow. 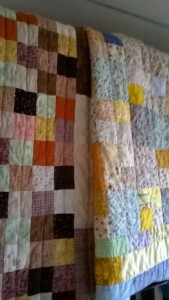 This entry was posted in Crafting and tagged jumbo carder, mini louet combs, patchwork, quilts, stash. Bookmark the permalink. I had exactly the same feeling this year Iwona, and am still diligently working through unfinished projects. Also doing a lot of decluttering, it does make you feel better. Love your quilts and this is something I and my group of pals have got into this year and are really enjoying. I wonder how many folk have experienced this 2017 energy Anne and what they’re doing with it. I’ve always loved fabric and sewing and seem to come back to quilts and quilting quite often. Glad to hear you’re enjoying it too.